“Rocky Road to Dublin" is a fast-paced 19th-century Irish song about a man's experiences as he travels to Liverpool, England from his home in Tuam. 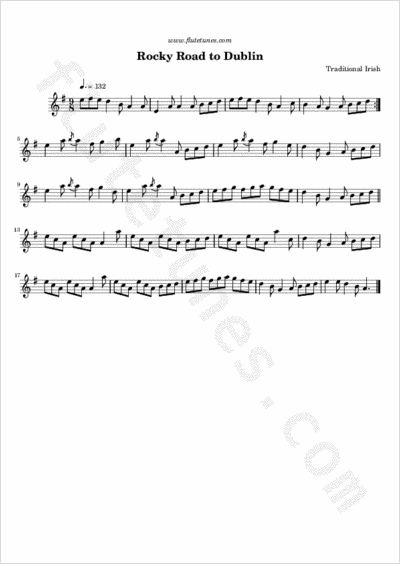 The tune has a typical Irish rhythm, classified as a slip jig, in 9/8 time. The song is partially recited several times by Mr. Deasy in James Joyce's Ulysses. It is an old favorite of the famous folk band The Dubliners; you may have heard their version in the 2009 film Sherlock Holmes, where it is used as a fighting scene playback and as an end-credits playback. Thanks to Tianna for suggesting this tune!